Zionist Organization of America (ZOA) supports Israeli Prime Minister Benjamin Netanyahu’s statement this week that the Golan Heights, recaptured by Israel from Syria in a war of self-defense, the Six Day War of 1967, rightfully belongs to Israel. 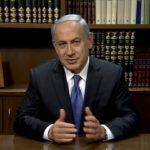 Mr. Netanyahu made his statement after President Donald Trump, with the Israeli Prime Minister at his side, signed a proclamation recognizing Israeli sovereignty over the strategically important plateau from which Israel had been repeatedly attacked during the period 1948-67, when it was under the control of Syria (Dan Balilty, ‘Netanyahu Says Golan Heights Move “Proves You Can” Keep Occupied Territory,’ New York Times, 25 March 2019). President Trump’s move reversed the position or inaction of successive administrations over the past 50 years. The ZOA stated that international law only prohibits the acquisition of territory by aggressive war; a state that has been repeatedly assaulted from territory subsequently wrested from the aggressor can rightfully acquire title to that territory in circumstances where the aggressor state is unwilling or unable to conclude a peace settlement and continues to threaten and facilitate aggression against the defending state. The ZOA has also cited international legal authorities who have demolished the notion that there is a prohibition on territorial adjustment in favor of states that have been attacked. There is also a long Jewish history in the Golan dating back to biblical times through the 8th centure CE. Jewish farmers populated the area in the 1800’s through the early 1900’s. The Golan was part of the mandate for the Jewish homeland, but Britain then traded the Golan away to France for British rights in Iraqi oil fields. “The ZOA agrees with President Trump and Prime Minister Netanyahu that it is way past time that Israel’s rightful control of the Golan Heights be recognized. 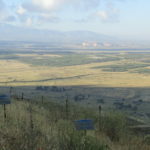 “The Golan Heights overlooks the Sea of Galilee, offering any occupying military force a clear and unobstructed view of the peaceful villages and towns lying below. “From the dawn of Israel’s independence in 1948, Syria rained artillery shells down upon innocent Israeli civilian communities and farms. Israeli farmers used to be compelled to plough fields in armor-plated tractors. Throughout the 19 years that Syria controlled the Golan Heights, peaceful Israeli life and agriculture were held hostage to periodic bouts of unprovoked Syrian aggression. “Instead, Israel wrested the Golan Heights from Syria in the closing stages of the war. Syria again invaded the Golan Heights in its attack on Israel during the 1973 Yom Kippur War but in the end, after fierce, courageous and even miraculous fighting, Israel repelled the Syrian aggressors. In 1981, Israeli extended its legal jurisdiction to the Golan Heights. “Under United Nations Security Council Resolution 242, Israel was not required to withdraw from all of the territories that came under its control. Notably, Israel did give up to Syria some of the areas, including the city of Quneitra, that came under Israeli control during Syria’s wars of aggression. Iran has used these areas as a base for launches against Israel in recent years. “Clearly, the idea that any and all territories lost by the Arab aggressors of 1967 must return to these countries is not enshrined in UNSC Resolution 242. Moreover, International Court of Justice Judge Stephen Schwebel also declared that territories lost by an aggressor state could be held by defending states until the aggressor made peace –– something Syria has never done, despite years of diligent Israeli diplomats efforts. “Israel offered to return the territories to Syria in exchange for a genuine peace settlement, but was greeted with contemptuous Syrian refusal to even sit at the same table with Israeli negotiators. In fact, Syrian diplomats only met Israeli counterparts face-to-face for the first time at the 1991 Madrid Peace Conference. “Throughout the 1990s, the Syrians refused to conclude peace with successive Israeli governments, despite being offered the return of virtually the whole of the Golan Heights that had been under Syrian sovereignty. Syria demanded that Israel return to Syrian control, not only the Golan Heights, but also strategically vital sovereign Israeli territory adjacent to the Golan Heights which Syria had seized in its war of aggression against the fledgling Jewish state in the 1948-49 first Arab/Israeli war. “Israel naturally refused what would have constituted an outrageous reward for Syrian aggression. Syria meanwhile periodically permitted Hezballah in Lebanon, the only Lebanese militia which it supported and permitted to function and arm while it controlled Lebanon, to launch rockets into northern Israel. And now, Syria is permitting Iranian forces to launch missiles into Israel from Syrian territory. “Accordingly, Syria had ample opportunity over several decades to demonstrate that it was interested in peace and to have the Golan Heights returned to Damascus’ control in return for a genuine peace treaty. It refused to do so. “In retrospect, just as well –– imagine the nightmare facing Israel had Syria had agreed to sign a piece of paper during the 1990s in return for which Israel had returned the Golan Heights to the terrorist Syrian regime. The Heights would have served throughout the recent Syrian civil war as a renewed base for aggression against Israel. ISIS and other jihadist groups running rampant in Syria would have been able to fire directly into northern Israel, as Syria once did. “Instead, Israel was able to use the Golan Heights to protect itself from ISIS attacks and Iranian-sponsored attacks and to actually provide a field hospital to treat Syrian victims of the civil war. “As a result of Syria’s refusal to negotiate peace, Israel has ruled the Golan Heights for 52 years –– far longer than the 21 years it was controlled by the Syrian state (1946-67). “It is only under Israel control that that the Golan Heights have been entirely peaceful. In contrast, under Syrian control, they served as a constant base for illegal and unprovoked Syrian aggression against Israel. “Let it also be remembered that this is only by chance that the Golan Heights was included within the original borders of the French Mandate over Syria and, later, the independent Syrian state. This was only because the British ceded the territory to the French Syria Mandate under the terms of the Paulet-Newcombe Agreement (1920), which settled the boundaries between the British Mandate of Palestine and the French Mandate of Syria. Indeed, prior to that 1920 agreement, several Jewish communities had been established in the Golan Heights with the approval of the previous Ottoman authorities who had controlled it until the end of the First World War. “There was otherwise no good reason in history, equity, demographics or anything else to suggest that the Golan Heights should be under the control of Syria. To the contrary, there are sound reasons –– historic, strategic and equitable –– why the territory should be part of Israel. “To claim that Syria is entitled to the Golan Heights despite its aggression and terroristic behavior over decades is to assert the absurd and unjust notion that a belligerent aggressor should lose nothing for waging unlawful, aggressive wars, as well as military assaults on peaceful civilians during peace-time. “President Trump has rightly sent a message of deterrence to would-be aggressors. Until now, Israel’s Arab enemies have always assumed that they can engage in continuous aggression in the confidence that, whatever else might happen, they will receive back lost territories as a right. That illusion was dealt a serious blow this week by President Trump, whom we strongly applaud and Prime Minister Netanyahu is entirely correct to assert that nations can retain territory conquered in a war of self-defense. 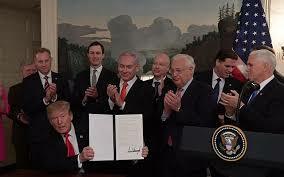 “The ZOA urges the U.S. Congress to pass a resolution reiterating President Trump’s declaration of US recognition of Israeli sovereignty over the Golan Heights. 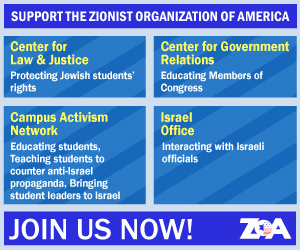 “ZOA proudly and with great appreciation and gratitude recognizes that President Trump has truly become a major historical figure in light of all the extraordinary pro-Israel and appropriate actions he has taken over the last two years. Zionist Organization of America predicts that President Trump will be remembered as an exceptionally revered figure in Jewish history.